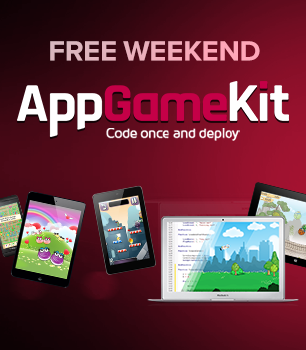 AppGameKit - AppGameKit Free for the Weekend? AppGameKit Free for the Weekend? AppGameKit FREE for the weekend? Yes it's true! AppGameKit is an affordable option for those who want to get into the world of app game coding, but we also recognise that many news users will want to try before they buy, and so we are pleased to announce the release of the AppGameKit Free Weekend which allows you to download and try the full version of AppGameKit over this weekend, and take advantage of the best discount we've ever run should you decide to buy. This free weekend version includes all of the AppGameKit Tier1 Scripting system with the full compiler and export options. We're unable to provide the Tier2 libraries because these cannot be protected. If you've not yet checked out AppGameKit why not give it a whirl this weekend and see how it performs, it comes with plenty of examples and demos. This offer is made available exclusively through Steam so check out the whopping discount and be sure to take advantage of it before Monday 10AM Pacific Time as this offer is unlikely to be repeated any time soon.